Starting May 15, 2004, Korean Air will offer three weekly non-stop flights to Prague, Czech Republic, from its hub of Incheon International Airport. Airbus A330 aircraft will be used in its air flight expansion to the gateway city to Central and Eastern European. Flights will depart from Incheon International Airport on Mondays, Thursdays and Saturdays at 1:20 p.m. and will arrive in Prague at 5:40 p.m. the same day. The actual flying time is approximately 11 hours and 20 minutes. Return flights leave Prague at 9:20 p.m. and arrive at Incheon at 12:30 p.m. the following day due to time changes. Prague is one of the few cities in Europe whose rich cultural heritages remain intact to this day. In addition to its artistic beauty, Prague is also known for its music — it is a home to many of the worlds most renowned musicians. "The new direct route will meet the increasing travel demand for the Central and Eastern Europe and attract more tourists to the region as Czech Republic joined EU this month," said Y. H. Cho, chairman and CEO of Korean Air. Cho said that Korean Air is also planning to start code-share operations on the Incheon-Prague route with its SkyTeam partner CSA Czech Airlines this year and expecting to further expand the cooperation onto intra-European routes using Prague as a gateway to the region. The national flag carrier currently flies to 16 cities in 13 European countries. 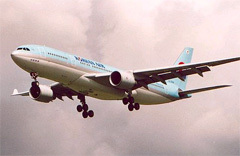 Korean Air, with a fleet of 116 aircraft, is one of the world's top 20 airlines and operates almost 400 passenger flights per day to 87 cities in 31 countries. Korean Air is a founding member of SkyTeam, the global airlines alliances with AeroMexico, Air France, Alitalia, CSA Czech Airlines, and Delta Air Lines that provides customers with extensive worldwide destinations, flights and services. Further details on Korean Air's programs, routes, frequency and partners can be reached at its official web site.